Jim and Connie work a growing organic farm in Northern Illinois called Grace Acres, where they raise rotationally grazed, grass-fed cattle and grow much of their food. 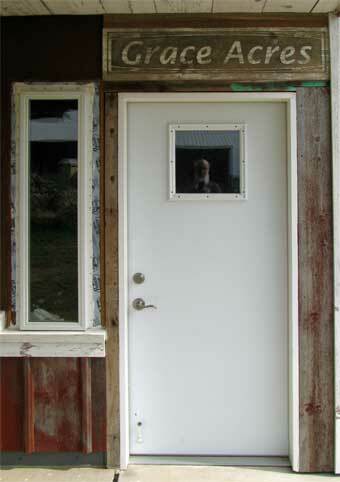 Jim is in the final fitting-out phase of his new solar heated straw-clay workshop building. 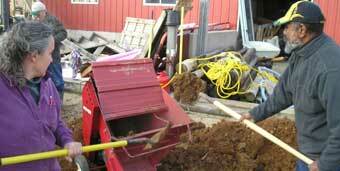 The location chosen for the shop was previously a hog barn in poor shape. 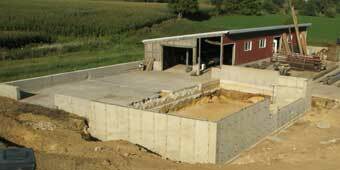 However, the floor slab and foundation wall was still in servicable condition. Jim took advantage of the opportunity to add a heavily insulated "earth box" type of solar heat storage (installation above) designed by Bob Ramlow. 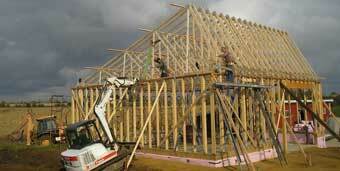 We used our 'chassis house-type' framing of 2x6 studs and wooden roof trusses aligned 24 inches (610 mm) on center. We incorporated an engineered system of steel strap X-braces (more below) because this site is exposed to strong, steady northwestern winds. The asymmetrical shape of the roof places the flatplate hydronic (fluid) solar collectors at the optimum angle in our latitude for wintertime heat collection. 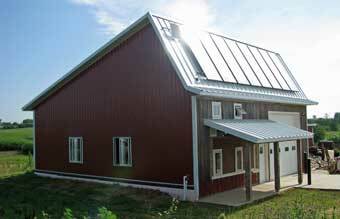 A small photovoltaic panel runs the pump that circulates the fluid between collectors and earthbox. 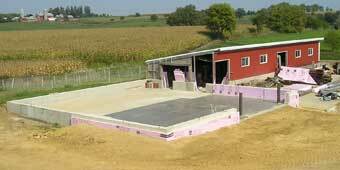 Starting in Autumn, some 26 tons of sand store months of heat below the floor. To provide the headroom Jim needs to work on big vehicles, the shop walls are tall — about 14 feet (4.3 meters) from floor slab to top plate. 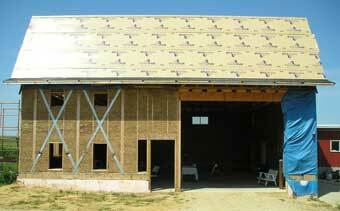 At 40 feet x 40 feet (12 M x 12 M) the building is a large, open shell with no opportunity for intenal bracing walls. 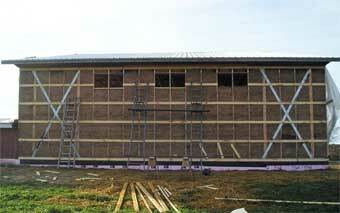 And the large roof structure adds even more surface area to catch the persistant winds. 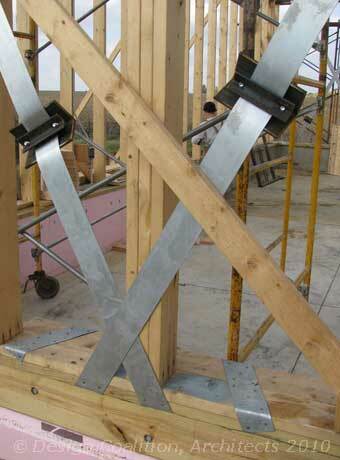 So we incorporated cross-bracing of steel straps to resist the lateral forces caused by the wind. Our structural engineer devised pre-tenioning clamps similar to the systems we observed being used in Australian sheds and warehouses. 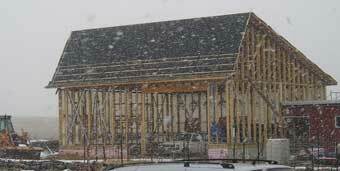 The X-braces are much stronger than let-in wood bracing, yet (unlike, say, plywood or OSB corner-bracing panels) allow the straw-clay to freely dry. 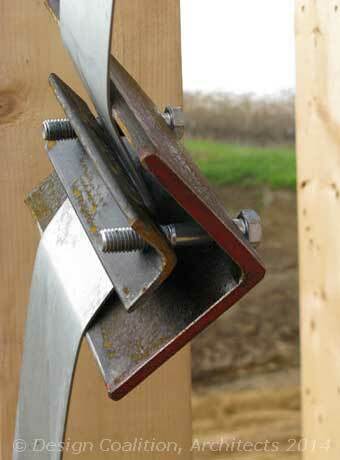 The clamps lie flush within the wall and are no real impediment to easy stuffing of the walls. Note the way the steel strap is wrapped around the baseplate. This allows for enough nailing to be able to resist the tension forces in the straps. Two nested steel angles threaded with bolts serve to take up the 'slack' in the strap after the wall is raised, to achieve a very rigid overall frame. Jim and Connie's approach to everything is very community-oriented. 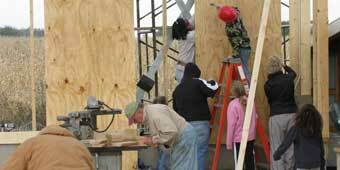 Building the shop was no different. 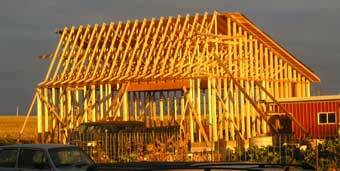 Sunset: Many people find buildings to be at their most beautiful just when the framing is finished. A surprise blizzard in late Autumn saw us mixing straw-clay in the snow -successfully- for the first time.